Well...I know it is a bit unusual but when I read the challenge details "Make the shape of the object you're photographing the most important aspect of your photo" I think it does fit the challenge. Because the words "I hate you" make the shape of the box important. The title is a tribute to Nirvana. Made me laugh, funny. Nice composition. For me, I find the object in the upper right detracts and maybe a different background, like black ? would help add to this photo. I do like how you have the paper tag coming out of the box. sometimes love and hate are so closely related. there's really not much too this photo. the tilting helps make it more interesting than it actually is. Sorry, but there are just too many distractions in this photo. The cropping around the main shape is very tight; the photo would benefit from some plain background space. The floral pattern on the box takes away from the heart shape. The object in the upper right corner draws the eye away from the central object. 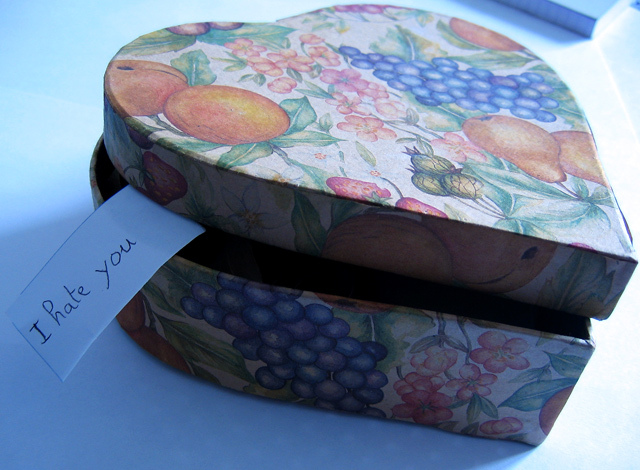 The tag coming out of the box breaks up the echoing heart-shaped shadow from the box bottom. And, the verbal message contradicts the visual message in a very distracting way. If the visual distractions were removed, perhaps this could be an interesting "mixed message" photo... but as it is, the photo doesn't say "shape" to me. That's not very nice you don't even know me? Hmmmm..what's in the box? Rattlesnake, scorpion...? I didn't think the box was that great, but the little slip made it much more interesting! Maybe should have composed it so the notebook in the top corner wasn't showing? Nice irony, but I think the blue color cast detracts from the photo. The shadow cast in the front makes this look too snapshotty. A better lignting would have improved this image a lot. (E.g. having a sheet of white paper reflecting the natural light and illuminating the front of the box would have helped IMO). what's that thing in the top right? Well, since you hate me I'm going to give you a low score! Just kidding! Proudly hosted by Sargasso Networks. Current Server Time: 04/24/2019 11:52:38 AM EDT.